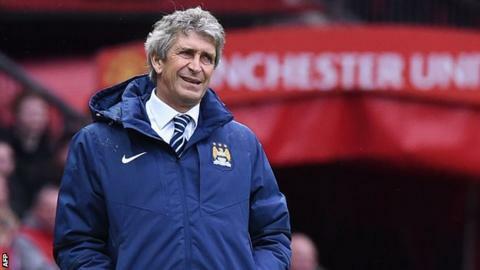 Manuel Pellegrini: Should Manchester City keep manager? Manchester City manager Manuel Pellegrini was the toast of the club after securing the Premier League and League Cup double last season. Less than 12 months on and the Chilean's job prospects appear precarious after a run of four wins in 15 league and cup games ended all hope of silverware. So where has it gone wrong? Is it Pellegrini's fault or his players? Should City stick with the manager or find a replacement? Here, fans, former City players and pundits tell BBC Sport what's gone wrong. Who is to blame for City's season - Pellegrini or the players? Former Man City defender Danny Mills: "It is a little bit of everything. There is clearly a tactical issue, 4-4-2 has been criticised many times. If you play 4-4-2 and it works - and City have the players to do that - it really isn't a problem. Unfortunately City have been found wanting - not just in the Premier League but also the Champions League. They haven't really had a Plan B or C."
Man City 1976 League Cup winner Peter Barnes: "Some players have become a bit blase and complacent. Players are making general mistakes, they don't believe in themselves. I've met Pellegrini a couple of times and he seems a nice man. Sometimes he doesn't start with the best team and I just feel this season has been a learning curve for him." Dave Wallace, editor of Manchester City fanzine King of the Kippax: "I'm against Pellegrini now. I've not seen any improvement since Christmas and we have not made any progress since last season. He signed Wilfried Bony but we have hardly seen him. There's been major mistakes and there is no sign of a 'Plan B'." Man City 1976 League Cup winner Dennis Tueart: "It's a combination. It's a team game. Everybody has to do their bit. No players want to lose a game. People's careers are important to them. The team has been drained of confidence for the last 10 or 15 games. There's been a lot of chopping and changing and players like to play in a settled team." Should Man City get rid of Pellegrini? Dave Wallace: "They are going to have to stick with him until the end of the season and look at it in the summer. I'd like to see someone with experience in the Premier League appointed - anyone other than Pellegrini." Danny Mills: "If I was a betting man I wouldn't bet on him being the manager come the start of next season. Is he too nice? Does he have that drive? Does he have that desire and mentality to throw tea cups at players or kick boots like Sir Alex Ferguson once did to get the players going?" Dennis Tueart: "It's not for me to say if Pellegrini should go. I'm sure they will be having an end-of-season review and asking him some questions, and he will have to have answers. I'm a fan of any Manchester City manager because I want my team to win." Peter Barnes: "Something has gone disastrously wrong in the last two or three months. They're not playing with confidence. City set high standards in 2012 and 2014 by winning the Premier League. Sometimes when you set high standards and fall below them then people will criticise. This has been a learning curve for Pellegrini and I'd like him to stay." Manuel Pellegrini studied engineering at the end of his playing career, earning him the nickname "The Engineer"
Who will replace Pellegrini if he goes? Danny Mills: "Are they going to get Pep Guardiola? I don't see it at this stage. Carlo Ancelotti? Possibly. One manager that hasn't been mentioned and I'm surprised is Borussia Dortmund's Jurgen Klopp. I know Dortmund haven't had a good season but he has pedigree and he has dealt with big players. He has had to reinvent that team time and again." How important is it City finish in the top four? Dennis Tueart: "It will be a disaster if they don't finish in the top four. That is the minimum." Dave Wallace: "Finishing fourth is going to be a problem. That means we won't know if we are in the Champions League group stage until around the transfer deadline, and attracting world-class players is going to be difficult. There's supposed to be another 6,000 seats being installed this summer taking the capacity up to something like 54,000. But I can't see us filling the ground with the way things are going." Danny Mills: "I think they will hang on to fourth, minimum. I don't think that will be a problem. But whatever happens questions will be asked of Manchester City at the end of the season." Peter Barnes: "It is imperative they qualify for the Champions League." What do City need to do to the team in the summer to improve? Danny Mills: "You have to remember James Milner is going at the end of the season - or that is the way it looks - Frank Lampard is going to go, there is talk of Yaya Toure going... there could be a large clear-out. You look at signings like Jesus Navas, who has been too predictable and has no real end product. How he gets in the team at times ahead of Samir Nasri and Milner bewilders me. There are big questions to be asked." Dennis Tueart: "There are some real decisions to be made on and off the pitch. The management and the executive have to get together." Peter Barnes: "There are seven or eight players Pellegrini needs to sell and rebuild the team this summer. Yaya Toure, for me, if he doesn't go then the manager has to find a new role for him. He can't get back to defend because he hasn't got the legs anymore." Henry Brittain: I'd give Pellegrini one more year, then get Pep Guardiola when his contract at Bayern runs out. George Powell: Pellegrini won the title last season, players like Eliaquim Mangala need time to settle in. Pellegrini to stay. Myles: No-one wants to play for Manchester City the way players want to play for Liverpool and Manchester United. They need players who actually support City. Former Manchester City player Trevor Sinclair: "Manuel Pellegrini looks worried to me. The results haven't been good enough for Manchester City - the size of the club now, they expect to be challenging every year and to fall away as they have done this season is very poor. The tactics haven't been great but the players have got to take responsibility as well. They've not performed." BBC Sport's Phil Neville: "The pressure is mounting massively because the results are going in the wrong direction. His team have lost momentum, they are now looking over their shoulder maybe at Liverpool. "So going from a strength of 'can we win the league?' to now thinking 'can we finish in the top four? ', I don't think that's good enough for a club like Manchester City. The players aren't performing but I think the manager sometimes, particularly with his tactics, are letting his team down."